As part of the Greymarch, Sheogorath summons a mortal champion to the Isles to fight back against the forces of Order. When Sheogorath disappears to become Jyggalag, this mortal mantles the role of the Mad God for a final battle with Jyggalag. If defeated, the Prince of Order believes himself free of his curse and vows to depart the realm, leaving the Isles and the title of Sheogorath to the mortal. However, this false hope is seemingly part of the curse, as Jyggalag is not freed. Instead, the mortal soul of the previous Mad God will become Haskill, a Vestige chamberlain forced to serve the new Sheogorath. 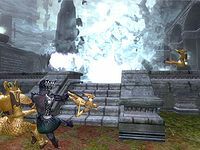 In 3E 433, the Champion of Cyrodiil arrived in the Isles to play the role of mortal champion, mantling Sheogorath and defeating Jyggalag and the forces of Order. It is possible that Arden-Sul was a mortal who had mantled Sheogorath previously, as suggested at the time by the beliefs of the Zealots and Heretics. Different incarnations of Sheogorath and Haskill seemingly have differing recollections of the Greymarch. Some misremember the events of past Greymarches and believe that a mortal champion is a novel approach, while others have very little knowledge of what the Greymarch even is. As Sheogorath, the Champion of Cyrodiil appeared to eventually realize the true nature of the cycle, stating that the title of Mad God is one which "gets passed down from me to myself every few thousand years". 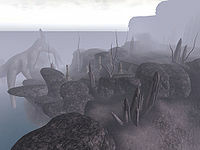 Few mortal inhabitants of the Isles ever live to see a second Greymarch; although they do not age without Sheogorath's will, few seem to survive the event. Esta página foi modificada pela última vez à(s) 14h49min de 23 de novembro de 2017.